We are a top notch supplier of Eye Bowl With Lid. Our company has been successful in winning appreciation from the clients as one of the most prominent names in the trading of Eye Bowl With Lid. We manufacture multifarious variety of bowls. A bowl is a round, open-top container used to serve food, and is also used for drinking and storing other items. They are typically small and shallow, although some, such as punch bowls and salad bowls, are larger and often intended to serve many people. 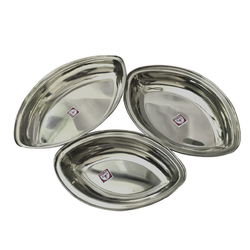 As these Stainless Steel Serving Bowls are equipped with lids, the chances of food getting spoilt is very little. These bowls are available in six size variants. 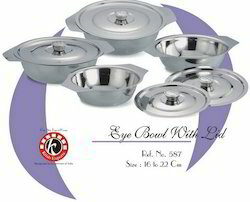 In order to meet excellent quality standards, we are supplying Eye Bowl With Lid.